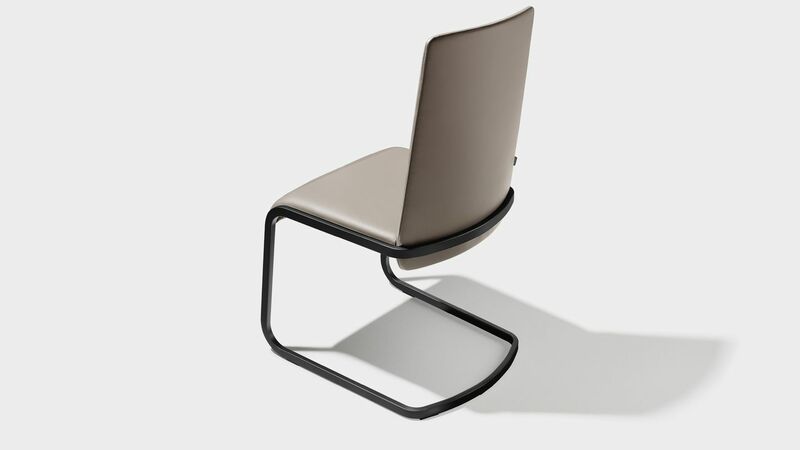 The most characteristic design element of our f1 cantilever chair is its graceful base that looks like an infinite loop. The backrest tapers off at the top and features a flexible shoulder zone and lumbar support that enables you to sit in an ergonomically healthy position. Encased by the frame, the backrest gives the chair a slender and delicate appearance. The optional armrests ensure additional seating comfort – almost like a bucket seat. An interesting detail of the cantilever frame is the rectangular bar that curves on its wide edge. This not only gives the f1 cantilever chair an exciting look, it also guarantees comfortable and durable springiness. The large choice of leather and fabric covers can be mixed and matched – in either a single colour or two colours.